Today Sarah and I rode with Jenny to Mad River Mountain to go snow tubing. It was 12 degrees when we arrived. 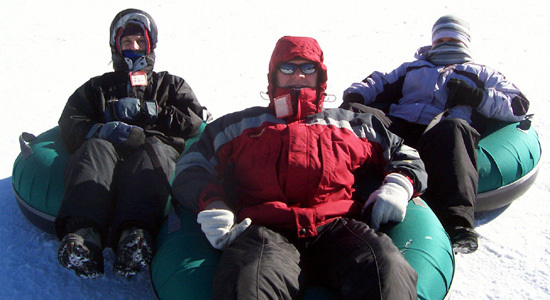 The tubing park has been moved since my last visit to Mad River Mountain several years ago. The tubing park is now on the side of the resort closest to the highway. It has more than double the tubing chutes, a total of 10 now. The chutes are also longer and wider than I remember them before. The tubing park now has it's own lodge and parking lot. The old location has been converting into a terrain park. We were all bundled up in your warmest clothes and headed for the snow. We all had lots of trips down the hill. Solo rides, group and racing too. I think the cold temperatures kept a crowd to a minimum. We all had fun, even without any broken bones or concussions. In fact, we didn't have any accidents. By the time we headed home it had warmed up to a blistering 15 degrees. We stopped for a hot meal at Bob Evans in Marysville on the way home. Ya gotta love their chicken and noodles on a cold day like this. Check out my pictures from the mountain.